Browse past projects from Alabama Appleseed. Any related resources for these projects can be found here. Chronic hunger is a debilitating problem that diminishes the physical, mental, emotional, economic, and societal potential of thousands of Alabamians. Alabama’s youngest are especially susceptible to the factors that cause chronic hunger and the far-reaching effects of that hunger. For instance, in Alabama 26.2% of children (294,060) will face food insecurity during an average year. Such hunger causes not only empty stomachs but also lost learning capacity caused by the physical and mental effects of hunger on educational attainment. Children (and adults) who endure chronic hunger are more likely to struggle with absenteeism, tardiness, behavioral problems, decreased health, and lessened learning capacity. In other words, chronic hunger sits as dead weight on many of Alabamians, hindering them from obtaining the ability to reach their potential and contribute fully to society. Hunger is a systemic problem that holds individuals, families, communities, and the state back from the dignity and justice of opportunity. To combat the problem, the Alabama Hunger Project focuses on identifying and developing policies that remove the systemic obstacles that prevent Alabamians, especially our children, from accessing the food they need to participate fully in society. The Alabama Hunger Project also works to identify and educate relative stakeholders and policymakers on the need for reform and and the importance of these policies in ensuring opportunities for all Alabamians. Many of the programs necessary to end chronic hunger already exist in Alabama, but are either underutilized or are inhibited by bad policies. The Alabama Hunger Project overcomes this under-utilization and these policy obstacles by educating the public on availability and importance of these programs, and by advocating for policy reforms that remove these barriers. This project is currently working on five fronts to end chronic hunger in Alabama: Breakfast in the Classroom (BIC); Community Eligibility Provision (CEP); Supplemental Nutrition Assistance Program (SNAP); Hunger Free Schools Scorecard (HFSS); and Appleseed Collaborative (AC). In 2008 Alabama Appleseed started a constitutional revision initiative. The goal of Appleseed’s initiative is a new Alabama Constitution, or the essential elements thereof. One of the main objectives to achieve this goal is to strategically engage Alabama’s lawyers and legal community as a catalyst to build both a substantive policy foundation and a network around the state of legal advocates for constitutional reform. A second objective is to engage Alabama’s many and varied constituencies interested in finding common cause for constitutional reform that will support the strengthening of educational opportunity, business and economic development, a more equitable tax structure, and state and local governments that will better function and be more responsive to citizen needs. a new Alabama Constitution, or the essential elements thereof. Alabama’s 1901 Constitution must be substantially revised in order to return actual political power to the citizenry, remove serious constraints to improving education for all children, release large and small businesses from limits on more profitably running their concerns and empowering state, city and county governments to better govern with less waste of tax dollars. A project to develop strategies to provide health insurance coverage for the over 600,000 uninsured Alabamians and, with the enactment of the Federal Affordable Care Act (“ACA”), to be a consumer advocate in the development of a health insurance exchange and the expansion of Medicaid. All of our work on health insurance coverage issues and healthcare reform is a direct continuation of the work we started several years ago as part of the Appleseed Network collaborative project on health insurance coverage options for small businesses and their employees, a collaborative project that included the Appleseed Centers in Nebraska, New Jersey, and South Carolina. As was done in this Appleseed collaborative project, Alabama Appleseed engaged Alabama’s health care lawyers on a pro bono basis to help on several aspects of its current project. Read more about Alabama Appleseed’s Health Insurance Coverage work or view publications. A project aimed at developing a unified voice for new immigrant populations in the state, ensuring the legal rights of immigrants, and promoting social integration and civic participation. Alabama Appleseed was one of the plaintiffs that joined the lawsuit challenging in federal court the constitutionality of Alabama’s new immigration law, HB56. Alabama Appleseed started working with the immigrant population of Alabama through our Hispanic Financial Access Project (2005) which quickly evolved into to our current Immigration Policy Project (2007 – present). 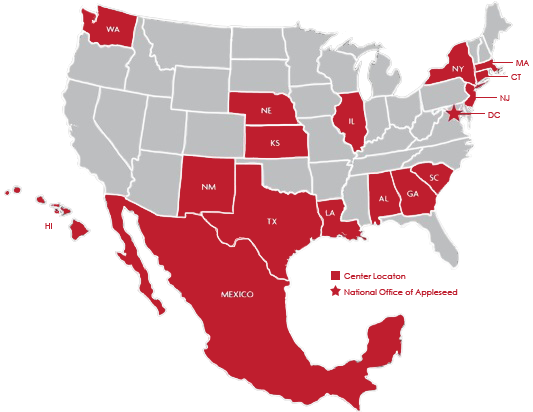 This project promotes policies that advance fundamental fairness, due process, and respect for human rights while ensuring the legal rights of immigrants at the state and local levels, oppose any proposed anti-immigrant policies and laws that work against these values and promote social integration and civic participation. Alabama Appleseed, with the help of community partners, took the lead in creating the Alabama Coalition for Immigrant Justice (ACIJ) so Alabama could have an identifiable group working for pro-immigrant law and policy. During the legislative session, we monitor the status of anti-immigrant bills and coordinate various appearances at committee hearings by our coalition partners and members of the community. We have participated in many events designed to reach out to the non-immigrant community where we seek to educate the non-immigrant community about the legal and policy ramifications of anti-immigrant laws and policies and dispel the myth-driven rhetoric spread by the anti-immigrant population. Strengthen and utilize connections with various individuals and community organizations throughout Alabama seeking Comprehensive Immigration Reform and other national policies promoting immigrant integration. A project to investigate the work place conditions and work place abuses in Alabama’s extensive poultry processing plant industry, which largely employs minority and Latino workers, and to advocate for needed work place reforms and worker rights. Through research and personal interviews, this project is a one-of-a-kind initiative designed to uncover and expose hazardous working conditions in Alabama’s poultry processing plants. Our paramount concern is worker safety, particularly for the minority and immigrant workers who lack knowledge of workplace safety standards and who most often do not pursue available remedies. Improved conditions in Alabama’s poultry plants could serve as a model for other state efforts, which in turn could be the impetus for reform at the federal level. Using Alabama as the venue for this initiative provides the potential for important and integrated state-wide and national impact. Alabama ranks 3rd in broiler production nationally (behind AR and GA) and 13th in total U.S. egg production. Our state’s 40 processing plants gross $9 billion annually (approximately 10% of the state’s economy) and employ over 80,000 people – either directly or in industry-supporting jobs. The top three poultry companies running processing plants in Alabama are: Tyson (9 plants), Wayne Farms (5), and Pilgrim’s Pride (6). Thirteen plants each gross between $100 and $500 million annually. Committed to exploring the current state and national policies and practices which negatively impact the health and safety of Alabama’s poultry workers, in 2011, Alabama Appleseed partnered with the Southern Poverty Law Center to identify and survey poultry processing plant workers about workplace conditions. This unique study will provide a picture of Alabama’s poultry processing work environment by documenting worker and product safety conditions through two methods: 1) Examination of various legal and governmental records regarding employment of and reported injuries to workers and 2) Conduct written surveys and oral interviews and analyze the resulting worker responses. We, with our colleagues from SPLC, collected approximately 300 surveys from present and recent-past workers in Alabama’s poultry industry – from chicken catchers to processing plant line workers. These anonymous surveys confirm that a large percentage of Alabama’s poultry workers face hazardous environments at work. Furthermore, processing line workers and catchers, in particular, are African American and Latino immigrants. Significant barriers for these workers in receiving adequate safety and health training include language and cultural differences, distance of work from large urban centers with significant media markets, lack of union representation, and lack of knowledge of workplace rights, among other factors. All of these workers work in a hazardous industry with injury rates double that of manufacturing as a whole. The report, published by SPLC, provides a rich source of experiential information allowing us to pinpoint workplace violations and to attach a “human face” to the workplace dangers and injustices. Such data and personal stories will inform our educational outreach and will enhance the informative value of the study. A statistical analysis, performed by Dr. Ed Papanastos of Troy University, will add rich context to the research and assist in forming a clear picture of Alabama’s poultry industry, sources of problematic issues, the impact of Alabama’s industry, and suggest viable solutions to identified dangers. Welcoming Alabama is a campaign designed to shift the immigration dialogue away from policy and focus on the common, core values shared by various cultures. It is not political, it is social and directed towards a positive civic integration of communities. We promote respectful dialogue, by providing a safe space to explore perceptions and philosophies between individuals of varying ethnicity and traditions. Alabama, according to census data, saw a 145 percent increase in its Latino population between 2000 and 2010. Demographic shifts of this scale are never easy – neither for new arrivals nor the receiving communities asked to adjust to an unfamiliar language or culture. But, aside from political arguments, editorials, and litigation regarding the state’s immigration law, there’s another story: individual sentiments and fundamental perceptions of all involved. In the wake of HB56, new leaders are emerging from both the immigrant and non-immigrant community across Alabama. There has been positive progress in community efforts Tuscaloosa, Birmingham, Auburn and Mobile, through student activism at universities, city leadership, individual community members, community organizations, local businesses and other interested entities . But, more can – and should – be done. Alabama Appleseed’s Welcoming Alabama Campaign, seeks to offer another opportunity for resolution, particularly by bringing together members of diverse communities, through respectful dialogue outside the political context and emotion-laden debates. For more information, visit our Welcoming Alabama website at www.welcomingalabama.com. Read more about Alabama Appleseed’s Welcoming Alabama work or view publications. Contact Zayne Smith for more information or questions related to Welcoming Alabama. A project to achieve more accessible and affordable banking and foreign remittance services for Hispanics. We developed a Spanish-language banking and financial literacy program that we offer throughout the Latino community. A project to advocate for various local, state and federal policy changes to assure faster, fairer home rebuilding and legal assistance to elderly and other at-risk storm survivors, and $100 million in federal funding for low-income housing. A project focusing on analyzing the effectiveness of the current indigent defense system and working with the Chief Justice’s Indigent Defense Task Force to develop a new system of indigent defense services for the state. A project to support State Bar Association and chief justice efforts leading to at least the non-partisan election of state appellate judges, and ultimately the merit selection of state judges, to eliminate special interest money from judicial selection. A project to develop and pass Alabama’s first residential landlord-tenant law. In addition, working with a coalition of advocates, we developed a Tenant Handbook for state-wide distribution. A project to encourage the development and implementation of restorative justice techniques in Alabama’s juvenile courts and educational system.